Access to Hotmail and several other Microsoft services was restored Tuesday afternoon after a server outage made it impossible for many users to sign in and access their e-mail. The Windows Live ID service, which includes the free Hotmail service, instant messaging and new Xbox Live accounts, went down at about 12:30 p.m. ET, according to a Microsoft statement. The problem was fixed in about an hour, Microsoft said, although customers were locked out for a while afterward. Arthur De Haan, a Windows Live spokesman, said a server failed, increasing the load on other servers. A new server was brought into rotation, but it took a while to resolve the logjam of attempted sign-ins and to redistribute that load among the working servers, he said. Hotmail is one of the two most popular e-mail services in the world, along with Yahoo! Google’s Gmail is third. UPDATE: 2:09 p.m. Just updated the carrier profile for my phone via iTunes. I had to reboot, but MMS is now working and I have sent and received a few messages. Now that this is done - Bluetooth remote profile puhhhhleeeeese? MMS (multi-media messaging) is finally going to be unlocked on the iPhone. ATT's Facebook Page says it should be out by "late morning" Pacific Time - translating to early afternoon for those of us in the Eastern Time zone. If you can't wait till the update comes through, the iPhone blog has a nice walk through that might sate you for a few minutes. But why do we care? (Besides the fact that it's a feature long available on practically every phone known to man.) You can e-mail pictures and videos from the iPhone already - and when you use email they usually get there. Plus, on cell phone networks, MMS can sometimes be a crapshoot. The real reason this is a relief, IMHO (in my humble opinion), is the nasty way AT&T handles incoming MMS messages from friends. 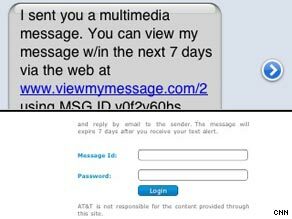 Under the old MMS system, iPhone users received a text message, with a link, a message ID and a password. So not only did it require extra steps to see the message, it was as if the user interface was purposefully designed to keep you from seeing that cute picture of a bunny your friend just had to send you. Of course, the new system comes with it own issues - mainly what the additional load of iPhone users sending and receiving MMS's will do to AT&T's seemingly already overtaxed network. PC World has a decent look at that issue (which I found via a tweet from @NPRALLTECH on Twitter). A fun bit of news has been flying around the Web today and over the weekend: A carrier pigeon beat the Internet in a race to move 4 GB of data between two towns in South Africa. 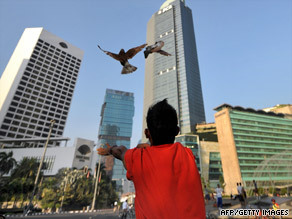 Pigeons being released in Jakarta, Indonesia. A pigeon named Winston carried a thumb drive with the data 60 miles in about 2 hours, the BBC reports. Meanwhile, only 4 percent of the data was able to travel over the Internet during the same timeframe. The race was set up by an IT company sick of slow download times in South Africa. The pigeon flew between two of the company's offices. The country ranks 87th on the International Telecommunication Union's list of countries with the best Internet and communication technologies. That puts South Africa behind Albania, Iran, Palestine, Peru and China, for example. The U.S. ranks 17th on the 2007 list. Sweden and South Korea take the top two slots. Unlimited Group set up the race. Kevin Rolfe, of that IT firm, told the UK's Daily Mail it's still a struggle to use the Internet in South Africa. "It's fine for emails and correspondence, but we need to transfer a lot of data from office to another and find it often lets us down," he told the paper. Telkom, a large Internet provider in South Africa, told the BBC it doesn't take responsibility for the fact that the Internet lost a race to a bird. Undersea broadband cables are joining Africa to networks on other continents, and there's hope those connections will lead to faster Internet experiences. As for Winston, the popular bird has a Web site, Twitter feed and Facebook fan page.